Join Sea Shepherd for their biggest event of the year at Seaworks on Saturday September 23rd as they celebrate 40 years of Sea Shepherd. This year's Stand Fast Festival is a massive day of entertainment, music, and food held annually to fundraise for Sea Shepherd's work defending marine wildlife worldwide. This year's event features a host of musicians, inspirational talks and screenings, children's activities and rides, and a wide variety of vegan food vendors and market stalls. 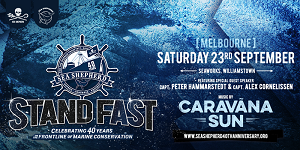 The Stand Fast Festival is an annual event to raise much needed funds for Sea Shepherd Australia to continue their ongoing efforts to defend, conserve and protect marine wildlife. Melbourne has always played a central role as Sea Shepherd's gateway to the Southern Ocean, and has served as the home of the Southern Operations Base where its flagship the MV Steve Irwin resides to prepare for upcoming campaigns. The music line-up is the biggest the Stand Fast Festival has even seen, with entertainment taking place on two stages throughout the day. The event MC is Lindsay McDougall (Frenzal Rhomb) with performances from Caravana Sun, The Getaway Plan, and Ella Hooper (Killing Heidi) and local Melbourne bands such as Drown this City and Rival Fire. Tickets from Eventbrite or on the door.